It is important to get ground in dust and loose dirt out before we shampoo. Our facility allows us to professionally shampoo your delicate rugs for best results. A proper rinse is the only way to assure all of the shampoo, dirt and oil is removed. Our facility allows for a two part drying process. The first squeezes the water from your rug to allow for an easy clean air dry as the second step. Our Area Rug Cleaning Process is the best in the business for several reasons. We are a unique facility using a specialized and gentle Oriental/Area Rug Cleaning system that leaves your rugs truly clean and returned undamaged. What makes us different from rug dealers and mere carpet cleaning companies is we focus on the chemistry of rug cleaning. We are constantly improving our cleaning techniques to ensure the best possible result for your rug. This is the service you deserve. So, when you choose Magikist as your rug cleaning company, you can rest assured it is being handled the right way and it is truly clean. Magikist is your only choice for thorough area rug cleaning as we never attempt to clean a quality rug in your home. Proper rug cleaning requires a controlled environment that assures that your rug is cleaned carefully and completely without causing residual damage to your home or short-cutting the cleaning process to avoid it. Magikist provides the optimal environment to control all situations that may occur with your rug during cleaning. We thoroughly inspect your rug to determine what type of fiber your rug is made of, the density of the pile, the type of weave and its country of origin. We measure your rug and inspect its overall condition. Then we test for color fastness and inspect the condition of the fringe. All of these things help us determine the type of cleaning and care it needs. We then provide you a copy of our report and review the information with you to ensure your comprehension of our findings. This way there will be no surprises and you can rest assured that your treasured rug is in safe hands. We consider dusting the most important step of our process. We have found through experience that rugs can hold a large amount of dust, dry soil and other particulate matter that if not removed prior to washing, can act like sandpaper on your rugs fibers, cutting the yarn, and reducing the life of the rug over time. This soil can also turn into cement like mud if not properly removed before cleaning also causing damage to a rug. For removing this soil, we use the Connersville duster, a 16 foot wide dusting machine. As the rug is being fed through the machine face down, the rotating arm slaps the leather straps against the backside of the rug to knock loose the dry soil. To offer premium support for your rug during this process, the flat bed dusting machine has a built in metal grid. This grid allows your rug to gently glide through the machine while offering even support to the foundation yarns all the way through. The dry soil knocked loose from the rug is pulled into a trap below the grid by a vacuum system. In-plant rug cleaning facilities like Magikist are the only locations which house machines of this magnitude. 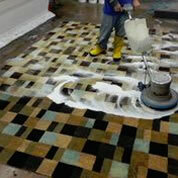 Magikist is the only in-plant rug cleaning facility in the state of Wisconsin. If we identified odors in your rug during our inspection, we will recommend options for removal. Pets, Smoke, Mildew, and other odors can be difficult to eliminate using regular cleaning products. We have many specialized, gentle products to treat these odors once we have identified them. Odors, even difficult to treat, are no match for our proprietary odor removal process! We guarantee odor removal or your money back! And here is why…A brief explanation of what happens with urine in a rug may help you understand why pet stains can be so difficult to remove. What makes up urine? Most of it is uric acid. But it also contains other things like urochrome or, yellow pigment. Many of the contents of urine are affected by what the animal ate and the overall health of the animal. The warm acid is a perfect breeding ground for bacteria, and that starts to flourish right away. The uric acid begins breaking down into ammonia and carbon dioxide. Ammonia is highly alkaline, quite often it is higher than an 11 on the PH Scale. Wool should never be exposed to an alkaline that has a PH greater than 8 and a half. A PH this extreme starts damaging the wool instantly. This is partly why the stains do not come out very easily. The wool has been damaged by the urine during this massive PH shift as it dries and begins to break down. Then factor in the pigments in the urine. This can also be affected by what the animal has been eating. Was the animal sick, taking medication or eating something that they should not have been eating? This high PH damages the original dyes in the rug and can make them completely unstable allowing the yellow pigments from the urine an opportunity to take over the dye slots in the wool. This, of course, cannot be corrected by regular cleaning. As for the yellow stain left behind, there are many factors that affect whether it will come out or not. Usually with synthetic carpets, we can remove the stain due to several factors. The dyes in synthetic carpets are usually stable and colorfast. We can also use higher ph products that will strip away the yellow pigments, without damage to the synthetic fibers. But wool is much more sensitive and cannot be exposed to the higher ph without damage. We do have products that can be used on wool, but they have limited success. The sooner you get to the stain, the better the results will be. Not every type of fiber and yarn used to construct rugs should be cleaned using the same process. 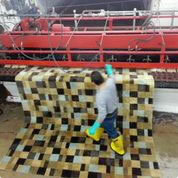 Every rug that enters our facility is given its very own cleaning considerations. We pay special attention to stain and spot removal and the prevention of color loss or dye bleeding. Every rug is washed separately with its very own unique set of instructions, rugs are shampooed by hand in our “immersion chamber” with a special Oriental rug shampoo that brightens and softens the fibers. Immediately after the shampoo, the rug is sent through our Moore’s Washing Machine. This machine is unique to the rug cleaning industry; it is recognized by cleaning professionals around the world as the most popular. 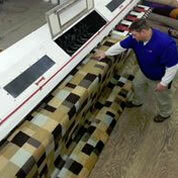 We are the only rug cleaning company in the entire state to have one. Here we apply a soft water rinse which flushes out the rug shampoo and soils remaining. If a rug is not completely rinsed, residues can be left behind that could result in fading, discoloration, erosion of fibers or premature re-soiling. After we rinse your rug, there are no soils, harmful chlorine or chemical residues left behind. This thorough rinsing leaves your rug soft and silky to the touch. Proper grooming of your rug is another important step in our rug care process. We carefully brush your rug in the direction the knots are tied which determines the direction of the rugs pile. This allows your rug to dry properly allowing for uniform texture and light reflection to ensure your rug retains its maximum beauty. This is when we also pay special attention to the fringe, detangling it to allow it to dry properly so that no damage occurs. The Moore’s Washing Machine compresses 95% of the water out before the rug is carried into our humidity controlled dry room for several hours, (overnight). Our temperature and humidity controlled drying room allows for calculated drying time. It is imperative we have a room like this to ensure the rugs do not have any issues that can and will occur when a rug stays wet for too long. Dried rugs are ready for detailing. Our trained technician’s review each rug and come up with a plan for removing the stubborn spots remaining on rugs. Rugs are rinsed a second time. Magikist knows that during the drying process of day one, any soils that were suspended deep into the rugs fiber or foundation, will work their way to the tips of the fibers much like an old oil lamp works, the wool fiber acts as the wick for water to draw the soil up the fiber during the drying process. This is known as “wicking.” This is why all rugs are rinsed a second time. Although our process seems to be extremely thorough on day one, it’s not enough to be perfect. This second rinsing on day two will remove the rest of the suspended soil. The pile is set in its proper direction and if the rug has fringes, they will be cleaned and groomed by hand. After the rugs are detailed, rinsed, and the fringes are cleaned they are placed back in the humidity controlled dry room for a second night. We re-inspect your rug to make sure it is the cleanest it can possibly be. We post-vacuum and dust to make sure there is no particulate matter left in your rug. If we detect any remaining soil or spots that can be removed, we will repeat any necessary steps. We absolutely love caring for these beautiful works of art and pride ourselves in our thorough but gentle process. 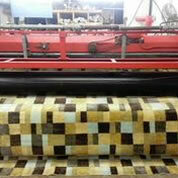 Before being rolled and wrapped, the rugs are tested using a moisture detection probe or meter. This is important to us so that if you decide to leave the rug wrapped for storage you can rest assured there is no moisture trapped in your rug’s fiber or foundation. Rugs are then rolled in their proper direction and packaged appropriately for storage. "Dave Magikist worked magic on my rug! The staff was wonderful to work with. They were highly responsive to all of my questions and truly a pleasure to work with. I'd inherited a beautiful large area rug but it was deeply stained from pets. I thought I'd give it one try to save the rug and purchased the deal offered by this company through Angie's List. My rug was delivered yesterday and looks brand new! There were three stains that they told me they couldn't remove. I can only see one of these, a tiny rust spot. I am so impressed and thrilled to be able to keep and enjoy this rug in my home for years to come. I will not even think about using another company in the future." - Sheila S.